are more efficient, cheaper and more eco-friendly than traditional plastic lids. They are an indispensable part of a drink and beverage business. 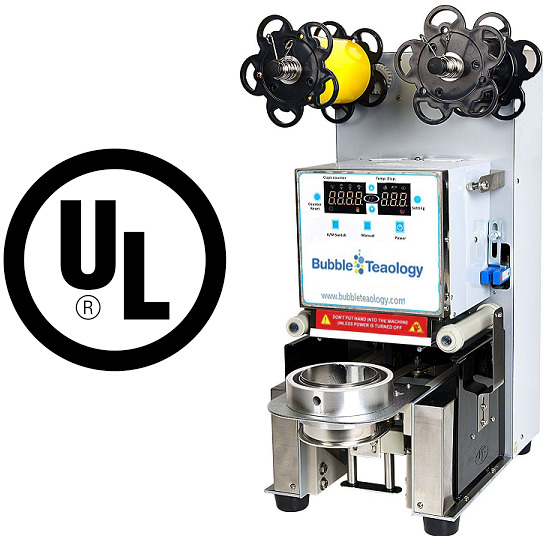 Bubble Tea is what made these sealing machines famous but we have helped customers in many different industries from sealing soup to gelato. For sealing bubble tea or any other kind of drink a seal with give your customer the option of carrying the drinks without having them spill. The plastic lid sealer machine allows the customers to move their drinks safely while keeping the freshness of the liquids intact. All they need is a straw to knock down the plastic and enjoy their drink on the move. These machines work by utilizing pressure and heat techniques to seal fine plastic films into a pouch or cup. The airtight seals allow the fluids inside the cups, to move around freely without spilling out. One important thing to note is that the sealer lid needs to be made out of the same material as your container to seal properly. it is vital to select the appropriate sealer film, which will comply with the cups or pouches. come in a roll that will fit directly onto your machine. The most common type of lid is made out of PP plastic. The standard roll of PP film is 115mm x 450m and can seal about 3,900 cups (95mm). There is also jumbo film available which is 160mm x 400m and can seal 2,500 containers. Other common types of lidding film are PET plastic, PE plastic, paper film and foil film. You can also put your logo directly onto your film to enhance your brand. use a fixed rings, which permit them to seal only a particular size of the cup. However you can also seal smaller cups or containers by using an adapter ring. Make sure that you check out the diameter of the container you are planning to seal. Usually, the bubble tea cups are 95mm PP cups, but you may also opt for the PET cups of 90mm, 92mm, 98mm or the Jumbo teacups of 120mm. The Universal Sealer Machine has the flexibility, to seal both 95mm PP cups as well as 98mm PET cups. Both cup sizes are perfect for the bakery or the beverage industry since they are safe to use, clear and you can also customize them with your own logo! The plastic lid sealer machines are available in manual as well as automatic models. While the automatic models require you to place the cup inside only, the manual models need the user to pull the lever and exert pressure on it manually, to seal the container satisfactorily.